After the success of Xiaomi Mi A1 and Mi A2 devices, the Chinese manufacturer Xiaomi is preparing their upcoming Android One smartphone. The Xiaomi Mi A3 is in the works with a codenamed ‘orchid_sprout’. The device will come with the latest Android 9 Pie firmware based on Android One program out-of-the-box. While the Mi A1 was codenamed as tissot_sprout, Mi A2 as jasmine_sprout, and Mi A2 Lite as daisy_sprout. Now, you can ask why all the Xiaomi Mi A-series devices come with a codename like this (sprout)? That’s only because Google’s Android One-powered all devices comes with the suffix of ‘sprout’. There are no detailed specifications revealed yet. But we can expect the following things from the Mi A3 device. The Mi A3 could come with Qualcomm Snapdragon 675 SoC coupled with 4GB/6GB/8GB of RAM and 64GB/128GB of onboard storage capacity. It’s expected that the device won’t have any expandable storage option. The processor is quite powerful to perform AI tasks easily and will feature AI Face Unlock as well. It will run on Android 9.0 Pie version based on Android One platform by default. 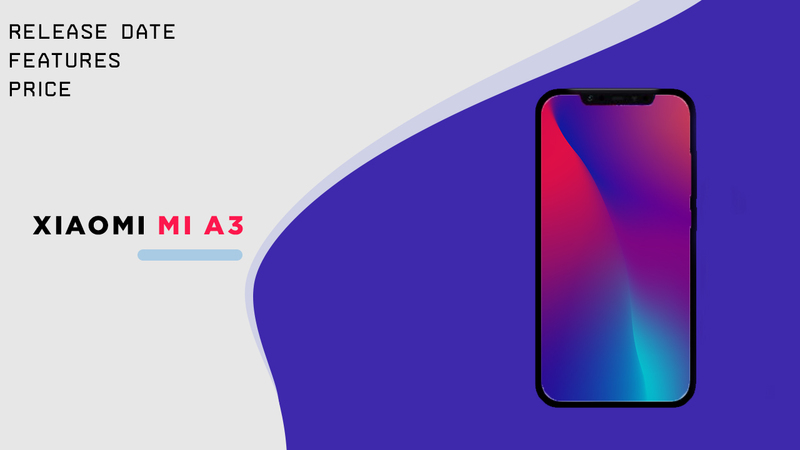 While the front design of Mi A3 could be quite similar to Huawei Nova 4 display. It will adopt an Ultra-High screen-to-body ratio display where the bezels will be lesser. It’s also expected that the front camera will be placed as a display hole to give it a premium look without any space issue. As we all know that all the Xiaomi Mi A-series stock Android devices offer great camera specifications and quality as well. The depth effect, sharpness, night clarity, AI mode, selfie all are so good. This time Xiaomi could provide a 32MP selfie camera which supports AI portrait mode, HDR etc. While the rear could have a triple camera combination. Such as 16MP+20MP+5MP for better depth and night clarity along with a LED flash. The whole body can be expected to come with a glass finish to give it a classy look with a Mi logo at the back. The handset is expected and leaked to feature an in-display fingerprint scanner. It should be packed with a decent 4,000 mAh battery with fast charging support, USB Type-C port, Bluetooth, GPS, Wi-Fi, NFC etc. As we all know that Xiaomi provides IR Blaster, a 3.5mm audio jack, FM Radio to all their Mi/Redmi devices. Now that will be an interesting thing to see whether Xiaomi can offer these options or not due to full display ratio. Xiaomi launched the MI A1 back in the September 2017 year and Mi A2 (Mi 6X) in August 2018 last year. So, it’s quite possible to launch with a big bang in August-September 2019 as well. The Mi A3 should be launched in China first, then the device will launch globally within a month or more. Currently, there is no information about the exact release date of this device officially. We have to wait for a few more weeks to receive reports or leaks. The Chinese tech-giant Xiaomi is always aggressive with their price category. They always try to consider an affordable price tag for any Xiaomi devices. The company also provides so many discounts, cash back, and festival offers as well every year. However, there is no official information revealed by the company yet. Still, we can expect the Mi A3 pricing could start from the $250 (INR 17,895) approximately for the base variant. We have to wait for pricing details as well. Please Note: All the mentioned details are based on leaks/expectations. In 2019, this is what we can expect from any Chinese smartphone manufacturer for a mid-range or flagship-killer device segment with Android One. The official announcement or device details could vary and that’s obvious. Stay tuned for more info and comment down below about your thoughts.